Duplex Residence at Raipur with 1BHK at Ground Floor and two small units for renting at First Floor. Wholly conceptualised and being executed by Architect Shadil and team. 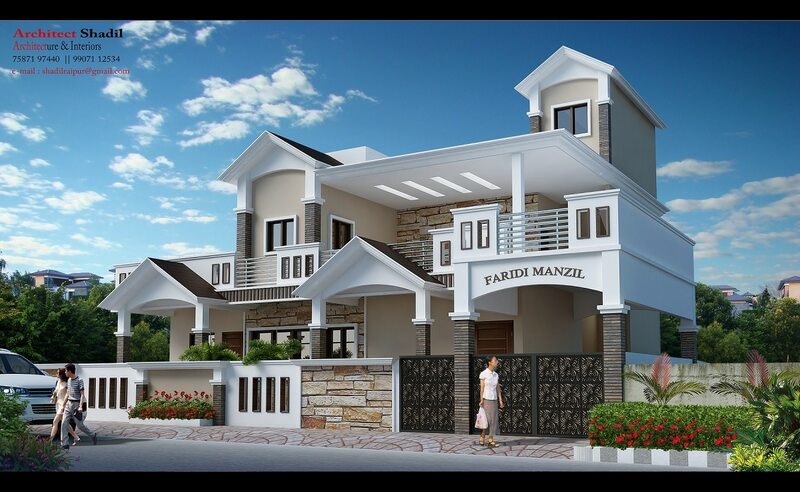 Proposed building elevation for Mr Sachin Tamrakar at Kabir Nagar Raipur. Wholly conceptualised by Architect Shadil and team. We understand that our approach should always match with that of the client and should not always end up as what we imagine. Proposed Front Elevation of Triplex Residence at Raipur. Not to forget, it is always accompanied by working elevation that is 2 dimensional, mentioning all the minute details. It is essential for converting virtual into Real. Lastly, as usual it has been wholly conceptualised by our team.